The first zinfandel was made in 1964, from a small nineteenth-century vineyard on Monte Bello ridge. Since this time, Ridge has championed single-vineyard winemaking, searching California for those rare vineyards where climate, soil, and varietal are ideally matched. 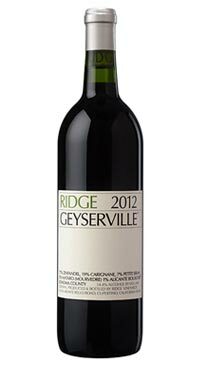 Ridge has made the Geyserville as a single-site zinfandel in every year since 1966. The grapes are grown in three adjoining vineyards on a defined stretch of gravelly soil approximately one-and-a-quarter miles long and a half-mile wide. It is a blend of 71% Zinfandel , 19% Carignane , 7% Petite Sirah, 2% Mataro (Mourvedre) , 1% Alicante Bouschet. Aromas of bramble fruit, wintergreen, licorice, and sweet toasted oak. Rich black cherry fruit on entry with elegant chalky tannins, gravel/rock, and ginger root. A layered, sensuous finish.